Early this morning we anchored at King George Island in the South Shetlands. The island is roughly 43 miles long and 16 miles wide at its broadest. Named by a British Expedition under Edward Bransfield in 1820 for King George of England. Less than 10% of the island is ice-free yet it supports several year round stations maintained by many countries. Base Presidente Eduardo Frei Montalva (known as Frei Station) is the Chilean Station on the Fildes Peninsula, built in 1969 and operated as a permanent village with airstrip, cafeterias for personnel, a bank, post office and comfortable homes housing families. At the top of the base is a Catholic Church. Chile (like Argentina and Great Britain) regards all of the Antarctic Peninsula and South Shetland Islands as part of that country’s territory. The terms of the Antarctic Treaty allow Chile to colonise the Fildes Peninsula without overtly pursuing its territorial claims.There is a lovely monument to the Antarctic Treaty signed in Washington in 1959, securing the future of Antarctica for peace and science, alongside a bust of Eduardo Montalva. Russia preceded Chile with the establishment of their Bellinghausen Station in 1968, separated from Frei by a small stream. On a hill above the stream is the first Russian Orthodox Church in Antarctica, and what a special little place of worship it is. We cleaned our boots before entering the tiny, heated interior and stood in awe of the paintings, curtains and gold fittings. The Russians also have a tiny, very antiquated souvenir shop, which our guests were thrilled to find and support. Agustin referred to it as a Russian cave, and he was not far wrong. The Frei Post Office and shop did a brisk business with our guests, wanting souvenirs to take home, send postcards and the like. The joy on many women’s faces clutching bags of merchandise was very gratifying. I teased one fellow about being a walking ATM, and his response was her smile was worth it! Postcards cost $4, and postage another $2, so nothing was cheap. It was a wonderful opportunity to wander around a working, modern Antarctic base. The vehicles used in these environs markedly different to what we are used to. I enjoyed looking at the equivalent of a raised four-wheeler, running on 4 independent rubber tracks, with a 360cc twin engine. Men carting 10 litre bottles of drinking water to the individual homes. A smart new Chilean Navy building, slipways for their Zodiacs. More fuel storage than one would have imagined, enormous generators providing electricity. Just behind the base is a large, modern airstrip. In the bay were some mightily impressive private mega-yachts. Legend, Enigma, Hanes Explorer and the brand-new Cloud Break amongst them. Cloud Break’s private helicopter took off twice and collected guests from the airstrip whilst we watched in awe. This sort of wealth is inconceivable to me, and all the team. Everyone was very friendly and courteous, the Base Commander coming to introduce himself. A huge totem pole with boards indicating direction and distances to cities all over the globe must be one of the most photographed poles in Antarctica. For this group of guests who have enjoyed incredible weather, calm seas and amazing wildlife sightings, Frei offered something completely different and what a morning it turned out to be in every respect. Some refer to it as being “Penguinned out”. Over lunch, Le Lyrial sailed north out of Maxwell Bay to Penguin Island which marks the eastern entrance to Admiralty Bay, South Shetlands. Penguin Island comprises a volcanic crater, with Deacon Peak 170 meters (560 feet) above the sea. The crater and cone are an unmistakable red colour, and the islands hosts scores of breeding seabirds. 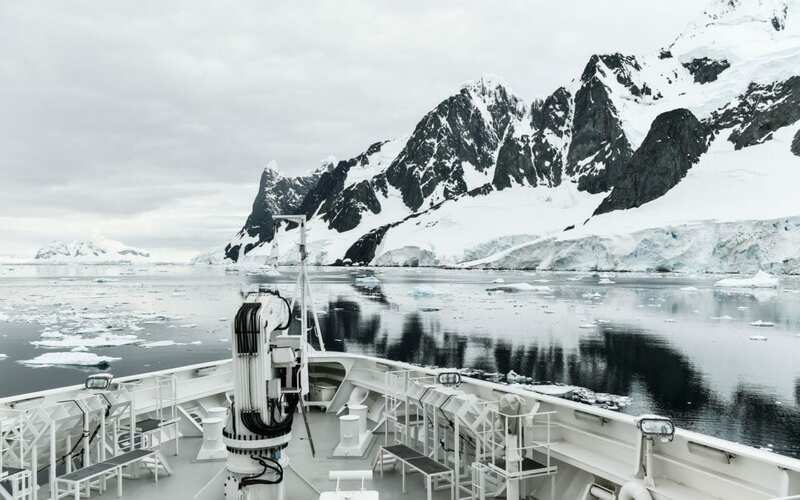 As the final landing day of this expedition, guests could not have requested finer weather. Under blue skies and no wind, we landed on Penguin Island. The landing was challenging, the beach comprising large, rounded, uneven boulders. Many guests required assistance from the Expedition Team to get across the beach to the snowline, some 50 meters from the Zodiacs. Most of the guests chose to tackle the strenuous hike to the top of Deacon Peak, and around the crater’s rim. They were justly rewarded with breathtaking views, photographic opportunities and the rare sight of a bright red crater. Some were blessed with sightings of 3 groups of Orcas in the ocean far below! All went across to view the Chinstrap Penguin colony – an infinitely easier walk that the crater rim. One could sense the nostalgia, guests aware that this was their last landing on the White Continent, and nobody wanted to leave this magical final destination under fine, blue skies. The last Zodiacs left the rocky beach at 7pm, with Patri’s inimitable Red-jacket Albatross presentation due at 7.15pm. At Recaps, Matt Messina spoke about conservation, and what we could all do in our own lives to conserve/preserve our beautiful planet and the Nature about us. Patri brought the house down with a hilarious comparison of our guests’ behaviour and that of Albatrosses. From catastrophic moulting, abandoning of chicks onboard, various mutations of colouration, foraging trips and the varying lengths of proboscis (lenses), this original spoof accompanied by appropriate photos is the presentation highlight of the expedition. Nobody can pull this off like Patri does. Whales are the largest mammals on Earth, and highly intelligent. Before commercial whaling decimated their populations, Antarctic whales comprised the largest stock – in sheer weight – of mammals ever to have existed on Earth. Whaling ceased in the 1930’s with whales almost extinct. Since the 1970’s commercial exploitation of whales is one of the most controversial conservation issues, and today controlled by the International Whaling Commission. Since the signing of the moratorium banning whaling, Russia have taken 60 000 Blue Whales illegally. Little wonder no increase in their numbers has been recorded. Thankfully most species show healthy increases in numbers. For me personally, when one considers the trust these beasts show in us, their intelligence and their curiosity, the means we devised to slaughter them, their having to surface to breathe just like us, and subsequent elimination is absolutely unconscionable. Yesterday we studied the bones and skulls of old whales, 80-100 years old, killed in the prime of life for their oil, the rest discarded. Some vertebrae were fused, indicating arthritis – I could have wept for these denizens of the deep. Sobering in the extreme. Tomorrow there will be a number of lectures on board, along with the return of life jackets, boots and waterproof trousers. The reality dawning, that we are now en route back to Ushuaia, this extraordinary experience and expedition almost over.